Leaving your babysitter a helpful set of instructions so everything goes smoothly is extremely important. The best way to accomplish this goal is by using the Babysitter Memo template to list and highlight all the fundamentals for your child. 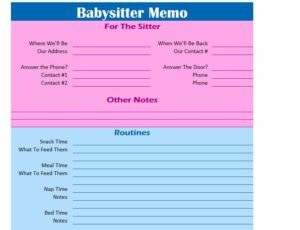 Whether it’s contact information or medicine that needs to be administered, the Babysitter Memo has a section for you to leave your babysitter with all the information they’ll need. This document is also fully customizable so you don’t have to worry about specific items on the list already given, just click on a cell and change anything you need. Download this template for free by clicking the link below. Let’s start off with the basics. At the top of the screen, you’ll list your contact information in case the babysitter needs to get ahold of you. You can also give times for when you’re expecting to be back home. Feel free to leave yourself any notes at the bottom of this section as well. The “Routines” section allows you to enter all the routines your child will do while you’re away. For example, you can list certain meals, nap times, and anything else they might need. This way, you won’t have to deal with a grumpy child that didn’t get their nap on time when you return. The “Activity Time” section works in a very similar way. Here, you can write down activities like playtime, watching movies, going out for a walk or to the park. The final section of the document is to list emergency contact information. You might not be able to answer the phone so you can add phone numbers of trusted friends and family in this section. Your babysitter would simply call one of them while you’re away. Using the Babysitter Memo, you can enjoy yourself knowing everything your child needs is being handled by your babysitter. Download this free template today to start customizing the document for your child’s unique needs.